Jeep Floor Liners are great way to protect entire Jeep interior from the elements. Rugged Ridge floor liners are a totally new concept that combines all the best features of a deep rib floor mat and the "old style" liners. Precision engineering using state of the art technology ensures an exact fit to the shape and contour of your vehicle's floor. Easy to remove and clean. Simply hose them off and go! The mat actually reseals itself around the hook! Whether it is a Jeep CJ, a Jeep Renegade, or a Jeep Cherokee, a Jeep is a rugged and dependable SUV that is at home on the highway and on the trail. It is equally at home on your camping and hiking trip as it is on your weekly visit to the supermarket, or taking the kids on the school run. We all know that it is important to keep the outside of our Jeep clean, and it is just as important to protect the interior from the elements and all those things you will load it with. Jeep floor liners are a great way to protect your vehicle’s interior from the ravages of the elements. That is where Rugged Ridge Floor Liners come in! Rugged Ridge Floor Liners are a new concept that combines the best features of both deep rib floor mats and the old-style liners. They are precision engineered and use state of the art technology to ensure an exact fit to the contours of your vehicle’s floor, whether you have a Jeep CJ, or a Jeep Renegade, or even or a Jeep Cherokee. These Jeep floor liners are easy to remove and clean. Simply hose them off, and go! The Rugged Ridge Floor Liner even reseals itself around the hook! 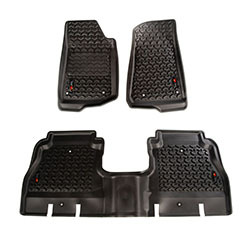 These aftermarket rugged ridge floor liners do not come straight from the manufacturer. If they did, they would cost a bomb! 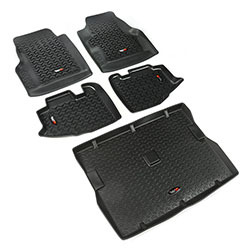 Our bulk buying power enables us to sell these Jeep floor liners at discounted prices. 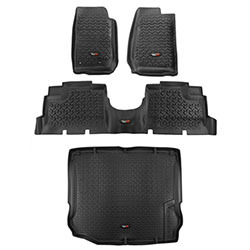 So, whether you own a Jeep CJ, a Jeep Renegade, or a Jeep Cherokee, we can save you a lot of money when you buy your Jeep floor liners from Shopjeepparts.com. By competing with others, we make sure you get the lowest prices. Why shop anywhere else when we’re offering the lowest price? 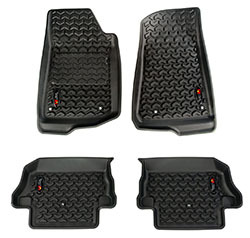 Another reason to buy aftermarket Jeep floor liners from Shopjeepparts.com is because these rugged ridge floor liners are precision engineered using state of the art technology to ensure an exact fit to the contours of your vehicle’s floor, whatever model of jeep you own. 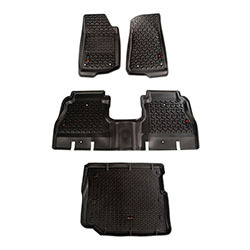 We stock Jeep CJ floor liners, Jeep Renegade floor liners, and Jeep Cherokee floor liners. When you buy a Jeep floor liner from the manufacturer, there is no guarantee that your part is going to last, or be of high-quality. 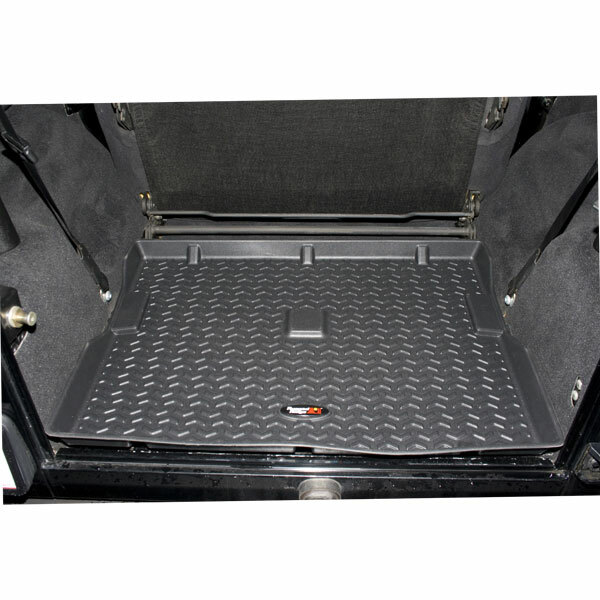 When you use an aftermarket retailer like us, however, you can be sure that you’re getting a high-quality Jeep floor liner that is not only durable, but that will do the required job and protect your vehicle. Shopjeepparts.com should be in the back of your mind the next time you need a replacement floor liner for your Jeep. We offer free, same day, shipping. At our low prices, it is a no-brainer to shop with us at Shopjeepparts.com.